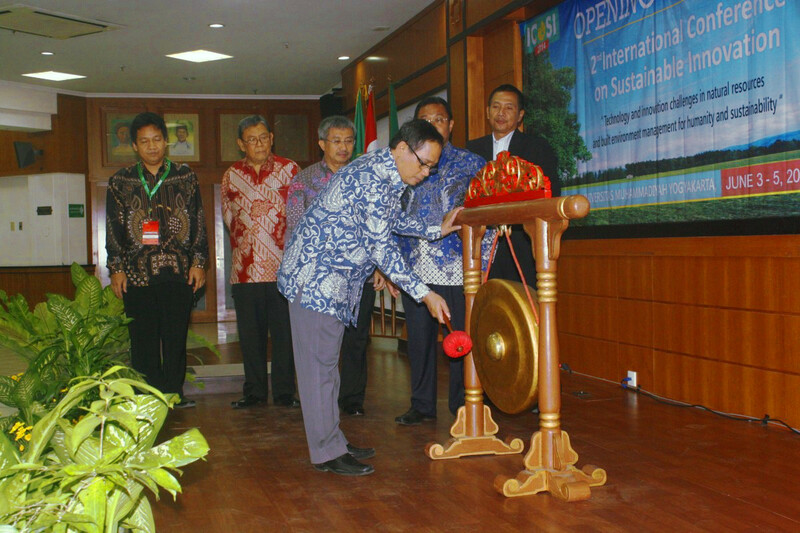 Universitas Muhammadiyah Yogyakarta, in cooperation with Association of Universities of Asia and the Pacific (AUAP), Technische Universiteit Eindhoven University of Technology (TU/e), and Singapore Polytechnic successfully held the 2nd International Conference on Sustainable Innovation from June 3rd to June 5th, 2014. The lively atmosphere of the conference fostered a great exchange of ideas among the participants on the issue of environment and energy sustainability. Prof. Bambang Cipto, MA, rector of UMY, opened the conference on Tuesday, June 3rd, 2014. A keynote speech from Ir. FX Sutjiastoto, MA, head of Research and Development Agency of the Indonesian Ministry of Energy and Mineral Resources, followed the opening ceremony. In his speech, Sutjiastoto focused mainly on Indonesia’s depleting fossil fuel, particularly oil and natural gas. By 2025, he stated, Indonesia is at risk of losing fossil fuel the country largely depends on. He called for sustainable technology and inventions to tackle such problems. Dr. Henny Romijn from TU/e echoed Sutjiastoto’s thoughts. In her speech, she called Indonesia’s position in the southern hemisphere very strategic to develop sustainable energy. She called for a balance between the economy, the environment and the social system. She introduced a ‘back to nature’ concept to face challenges regarding energy sustainability. The conference attracted academics and professionals alike from fourteen countries, representing Indonesia, Taiwan, Malaysia, Singapore, the Philippines, Nigeria, Swedia, Mauritania, the Netherlands, Australia, United Kingdom, India, Afghanistan, and Japan. Out of 175 abstract submissions, the committee selected 68 papers for oral presentation and 32 papers for poster presentation. Throughout the conference, experts in various disciplines shared their thoughts on either of the conference’s symposia: innovation technology for natural resource exploitation toward sustainable environment or sustainable development of technologies, the built environment, green cities, and green economy. A gala dinner in Ratu Boko Temple, Yogyakarta, closed the conference on Thursday, June 5th, 2014. The participants enjoyed a feast with a touch of Javanese arts as gamelan and dancers entertained the guests throughout the evening. Henny Romijn hopes to come back to Indonesia and continue the cooperation between the two universities by conducting future academic events. Mara Wijnker, a participant from the Netherlands, stated that the conference gave an overall good impression on the participants. She particularly praised the committee’s work to bring interesting issues to the spotlight, creating a great interest among participants to be engaged in the biannual event. The participants of ICoSI also enjoyed a city tour in Yogyakarta on their last day of stay. They visited the celebrated Borobudur temple and marveled at the wonder of the silver craft industry in Kotagede, Yogyakarta.